Here’s an update on one of the small ripples created by the Storefront Library in Boston’s Chinatown following our closing in February. At the conclusion of the project, our volunteers and staff went to great lengths to distribute the components of the Storefront Library to seed emerging projects in the neighborhood. Read more here. 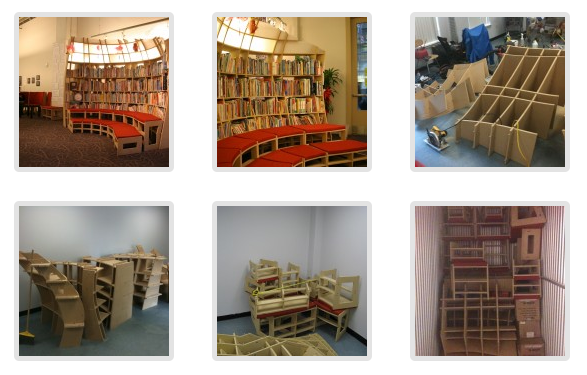 At the time, one of the recipients, Buds and Blossoms, a new daycare facility run by the Asian American Civic Association was to receive the Storefront Library Childrens’ Pod furniture and shelving and a “starter kit” of board books. As it turned out, Buds and Blossoms was not able to fit the shelves in their space, so we had to re-route, and fast. With the help of Alex Zhang at Asian Community Development Corporation we brought the shelves and seating to the community room at Oak Terrace, a public housing complex just down the street. Our idea was that the furniture could be used in creating a reading room for children who live there. We also made a on-the-fly decision to “slice” the eight foot tall shelves in half, so that the bottom portion could still be used in spaces smaller than the Storefront Library. And we made repairs to the chairs. Alas, several months later, it was necessary to move the furniture again, this time to storage while the Oak Terrace space was renovated. But we’re going to keep at it, and someday these assets will be part of a reading room in the neighborhood. Stay tuned.